Home / Automobiles / product or service reviews / Is Fortuner 4x2 worth 10 lakh premium over XUV500 W6? Is Fortuner 4x2 worth 10 lakh premium over XUV500 W6? This post was overdue since months, because of Thailand, Jaisalmer and Goa visits. In March this year, I drove an XUV500 W6 for 2 days/1200kms. In July this year, I got to drive a Fortuner 4x2 manual, for 1 day/540kms. 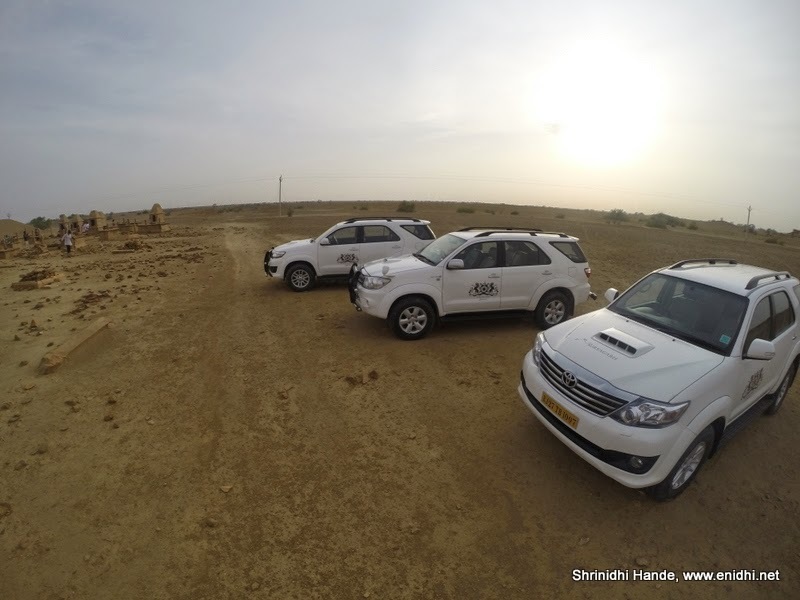 In August, we were driven around for 2 days all around the desert at Jaisalmer in a fleet of 3 fortuners. Mahindra XUV500 W6 variant costs about 12 lakhs ex showroom Delhi, while Fortuner 4x2 MT is priced 22 lakhs Ex-showroom Delhi. On road price will be 20-25% higher, taking the net difference between the price of two cars in question to whopping 10-12 lakh rupees. While I was thinking about reviewing the Fortuner, it hit me that why should someone spend 10 lakhs more on a fortuner, while XUV W6 has most of the capabilities and features offered by Fortuner. With that thought in mind, this post is an attempt to find out the differences between Mahindra XUV500 W6 and Toyota Fortuner 4x2. Objective is to find out if the fortuner is worth another 10 lakhs or is one better off buying an XUV500 which seem to be equally competent. Do go through and feel free to add your thoughts. Fortuner has more powerful engine, better brand recognition, higher ground clearance and better off-road abilities (even in 4x2 variant), all alloy wheels and better entertainment system. But for all practical purposes, these differences don’t appear good enough to justify a price difference of 10-12 lakh rupees compared to Mahindra's W6. For many instances, I feel XUV500 W6 is a better deal than Fortuner 4x2. Though Fortuner has some clear advantages and benefits, the advantage of being able to save about 10 lakh rupees outright, without any major compromise can easily tilt the situation in favor of XUV500 for the upper middle class, ‘Not so super rich’ buyers. Besides paying more upfront, Fortuner owner pays more in fuel for every km, pays more for insurance and maintenance. We drove XUV in March, when AC was used heavily. Fortuner was used in June when it was raining- I think this has contributed to Fortuner giving us better FE. Fortuner’s massive ground clearance goes give it additional abilities during off road. This, coupled with some extra torque, Fortuner 4x2s could easily take us around the deserts during our Jaisalmer trip, where Fortuner 4x2 proved to be equally capable as its 4x4 version. I am not very sure if an XUV500 W6 can beat a Fortuner when it comes to dune bashing. XUV is wider, but shorter in length. Fortuner has more luggage space, while with a XUV, you will need roof top carrier if all 7 people have 1-2 bags each. I do not have exact numbers, but prima facie, XUV500 will be cheaper to service/repair/maintain. Fortuner undoubtedly commands more respect and admiration on the road, clear reason why many politicians prefer Fortuner even though they don’t use any of its premium features. If spending 10 lakhs more means nothing to you (or when you’re wasting taxpayers money), then by all means go for Fortuner! When in Jaisalmer early this month, we spent 2 days being driven all around the desert in 3 fortuners. Fortuners crossed sandy roads, roverbeds, non-existent roads with lots of ease and comfort. So fortuner’s ruggedness, ability to handle bad roads etc are not in question. Only question is, is it worth compromising a bit on these aspects if it could save you 10 lakhs upfront and few thousands every month. Having said all these, one thing I am not able to comment is the durability. If used regularly for say 7-10 years, which of the two will be in better condition? Can Japanese build quality prove to be more stronger than Mahindras? I don’t know. Fortuner comes with 3 year/1lakh kms default warranty, while the Cheetah comes with only 2 year/65000 kms warranty. Use your judgment. When launched, XUV had some build quality issues, which now is reportedly resolved. Toyota’s engines and car build quality is much respected in the industry, so Fortuner has higher quality benchmarks overall for M&M to meet. Practical comparison. Every car review should have these components ! The XUV's numerous bells and whistles notwithstanding, at the end of the day, it is more alike to a FWD hatch than it is to a SUV. That alone makes a huge difference when it comes to off-roading capability. Take the XUV to a steep gravelly incline and you will quickly regret buying it and realize any of the RWD "SUV"s would have been a better choice. Coming to reliability, Japs lead the charge, with Toyota and Honda at the helm. It happens that only 3 cars have been driven to the North Pole. All three were Toyota Hilux's. Fortuners are based on the Hilux platform and even have the same 3.0L D4D engine. In the real world, there are numerous examples of Toyotas running around with lakhs of km on the odo. Also, the XUV's 3rd row being suitable only for kids on longer drives, effectively becomes a 5 seater FWD. So from a practical point of view, the question isn't whether one should get an XUV instead of a Fortuner, but whether you should buy a Fortuner or a Scorpio! Thanks for the detailed comments. As I said in the end I couldn't comment on durability and also off road abilities of the two cars. Good points there- you're saying either go for Scorpio which costs just half of Fortuner or invest in a Fortuner itself..
Not exactly, I'd always say take a test drive and go with what your heart wants! The Scorpio has better VFM. XUV costs more but unless you have the 4x4 version, you're gonna get stuck on slippery roads along with all the hatches and sedans. So paying such a huge premium just to get some extra ground clearance wrt. a hatch doesn't make sense. Unless you are someone who enjoys all the gadgets and the handling that only a monocoque can provide. But of course, like you said, a lot of people just choose the biggest car they can afford, in hopes of gaining some social status. Just one point. How many of us have the heart to really take these costly SUVs off road in the true sense. Taking your veh a little off the road is not off roading. For that, one can go for better options like the gypsy king 4x4 soft top...Mahindra jeeps...which have better off roading capabilities and basic comfort. Indian market is confused with luxury SUVs and off roaders.